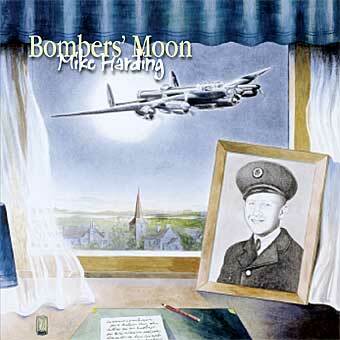 Special Note: Bombers Moon Remastered from the original with a new cover designed by Irish German artist Joe Boske this album from the early eighties is now available once again. 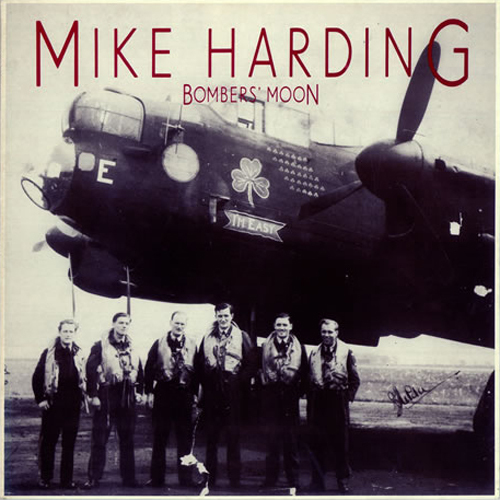 It features classic tracks such as God Help The Poor and The January Man as well as Mike’s most requested song ever; Bombers Moon. This album was recorded and released originally in April 1986. When we came to re-release it I found that all the multi track master tapes had been wiped and sold off by an over-zealous studio manager so that any remixing or rerecording was obviously impossible. What you have here therefore is a digital transfer from the original analogue two track master with a little bit of cleaning up. So – it’s a warts-and-all release of the pre-digital original. If it sounds very ‘eighties’ then so be it – it is a record of its time, more importantly I suppose it is also a record of how I was at the time. I dedicate it to the memory of my dear friend Colin Goddard who was a pal from the days we arrived at Mather College Manchester to study to become teachers to the day he died tragically young after a long fight with Chrone’s Disease. He was one of the most beautiful people that ever walked the face of this earth. Honest and truthful, hilariously funny, a terrific musician (listen to his lead guitar work on God Help The Poor and Factory) a great recording engineer and a true true friend. Nobody who ever spent any time with him can ever forget him. All his friends miss him and I see him often in my minds eye, his glasses held in his teeth, swinging by one arm beneath his bearded chin as he peers at a soldered joint or nodding his head as he takes a guitar lead in his old band Walter and The Softies. Colin recorded most of my live comedy albums, founded and designed Moonraker Studios with me and engineered this album. He also put in many of the musical ideas and was a good enough friend to tell me when something was rubbish, it is as much Colin’s album as mine. I miss him terribly. Engineered by Colin Goddard and produced by Mark Vibrans and Mark Harding. Mark Vibrans also arranged the brass, strings and woodwind. Most of these songs are about people, ordinary people, working, making love, going to war. I don’t write about Queens or Princes or Lords or millionaire oil men because I don’t know any and, in any case, they have more than enough written about them as it is. Three of the songs are written by other people and I’m proud to sing them; the rest of them, for good or bad, are my own. This song explains itself although I would just like to say two things: Firstly, the arrangement is based on Cajun and Tex Mex music hence the accordion and cornet. Secondly I’m not poor now but I was once. I had a wife and two children, lived in a rented terraced house in Lower Crumpsall that was so small the mice were hump backed. I lost my job as a labourer and for months walked the streets looking for work. It got so desperate that at one stage we took the four three penny bits that were used to balance the pendulum in the old clock we had and spent it on a tin of beans for the kids so that at least they had something to eat. During the seventies it looked as though things were getting better for everybody then Thatcher flew in on the three o’clock broom and cardboard cities and beggars started appearing on the streets. My one wish is that some day I see Mark and Carol Thatcher selling the Big Issue outside Marks and Spencer. Written by Dave Goulder, a one time foot plate man in the good old days of steam trains, who was also a keen walker and climber. He left his hometown of Nottingham to run a climbing centre in the Torridon Hills in Scotland and it was there, he says, that he saw for the first time through his townie eyes the year passing month by month through the seasons. Dave now runs courses in dry-stone walling but is still singing and writing songs. This I believe is one of the most perfect songs ever written. Eric Bogle, a young Scots Australian, wrote this in celebration of the ANZAC landings at Gallipoli in 1915 and the sacrifice paid by so many of the troops who were lost in that blunder. Eric told me once that he felt that the song, although about a tragic event, should not be sung as a dirge. I hope I’ve done it justice. Dedicated to the memory of my father, Flight Sergeant Louis Arthur ‘Curly’ Harding, a navigator in Lancaster Bombers, who died with his crew when his plane was shot down returning from a raid over Germany. Its also dedicated to the memory my good friend Jurgen Boch of Cologne, who was a small child in a bomb shelter in Germany on the night my father died, and to my mother who was a bride, a widow and a mother within the space of a year. I was a penniless student wandering round Manchester, staying up all night in all-night cafes making a cup of coffee last for ever and arguing about life and politics through the night. This song is about the morning after when the sun came shouting into the city and, faintly delirious and high on the pure wonder of being alive, I wandered round watching the town waking up. The song was written down in 1975 but was really written in those mad days of testosterone and Holts’ Bitter – 1960 -1963. A SMALL HIGH WINDOW When I was seventeen I worked scaling industrial boilers for a Northern firm. One of the places we worked in was a massive steel foundry in Manchester. There was a window high in the far wall of the sheds, that let the only bit of light into the foundry cavern, where huge steam hammers pounded red-hot steel into shafts for giant turbines and cranks for ocean going ships. There was a boy there the same age as me. He, like me, was crazy on cycling, climbing and rambling the Pennine moors. On hot summer days locked in that noisy dark prison, we could see through that small high window the far shimmering hills where we both so much wanted to be. I was lucky, I got out. I suspect that he didn’t – I often wonder what happened to him. This is his song. This song was written by Bruce Springsteen and when I first heard it the image of a man walking to work through the rain, on a grey morning that I saw in my mind’s eye, was one I had seen in reality on so many mornings that I knew I just had to sing the song. In 1916 the British Army, running out of cannon fodder for the trenches, introduced a policy of recruitment based on enticing men into the army from the same towns. Lord Mayors were encouraged to call for volunteers from their towns and the famous ‘Pals’ regiments were formed. Accrington, a small town in Lancashire, was the smallest town in England to field almost a full battalion of a thousand men. On the first day of the Battle of the Somme, ‘The Pals’ were in the front line and were in the lunatic attack that climbed over the top and walked towards the German Trenches, some of the lads kicking footballs ahead of them, believing the General’s promise that it would be a pushover. The Germans were so well dug in that they had survived the heavy bombardment that preceded the battle. Their machine guns cut men down like a scythe reaping corn. Of the Accrington Palls battalion of almost a thousand men, 375 were killed and 286 wounded. Contemporary accounts say that there was not a family in Accrington that had not lost a father, son or brother, one woman lost her husband and three sons. The effect on the town was so disastrous that the government dropped the policy almost immediately. But still hasn’t stopped politicians from sending young men off to war. The song is followed by the Scots pipe tune Battle of the Somme and I pinched the idea of sticking it on the end of the song from John Tams who did it on Lark Rise To Candleford. It was a wet, cold, foggy November night in Scunthorpe, half-way through a 60 night tour of one night stands. My suitcase was full of 30 night’s dirty washing. I had a sore throat, a hangover and after the show we went round Scunthorpe and it was shut. Feeling very sorry for myself, I wrote this song. I soon got over it. Working in a mill in Rossendale, Lancashire, one day I saw a sign outside the factory gate that just said ‘Hands Wanted’. It occurred to me then that the working people of the world have never been thought of as anything more than a pair of hands to weave, dig, fish or fight for a country in which, as Ed Pickford says, they’ve never owned one handful of earth! Like ‘Good Morning, Morning’ this is a song about a much earlier time in my life. I was a rock and roll guitarist in the ’60s playing lead guitar in such Manchester Bands as The Stylos, The Rainmakers and the Renegades. We played on the same bill as the Beatles, the Hollies, Alvin Stardust (Shane Fenton as he was then) The Big Three, the Swinging Blue Jeans….ah those heady days when we gigged the Cavern, the Iron Door and the Peppermint Lounge in Liverpool, Manchester’s Oasis and Jungfrau, Bolton Locarno and finally the heady heights of Cleckheaton Town Hall. So picture, if you can, a 60’s rock and roll club down the back of town near the canal, the river and the gas works and a couple of fifteen year olds mad with love on a frosty night and with no money and nowhere to go to be alone, apart from the cold canal bank, behind the club called The Back Of The Moon. Recorded at Moonraker Studios, Longsight, Manchester.